Gumtree is the top-ranked classified advertising site in the UK with sister platforms in other countries such as Australia and South Africa. 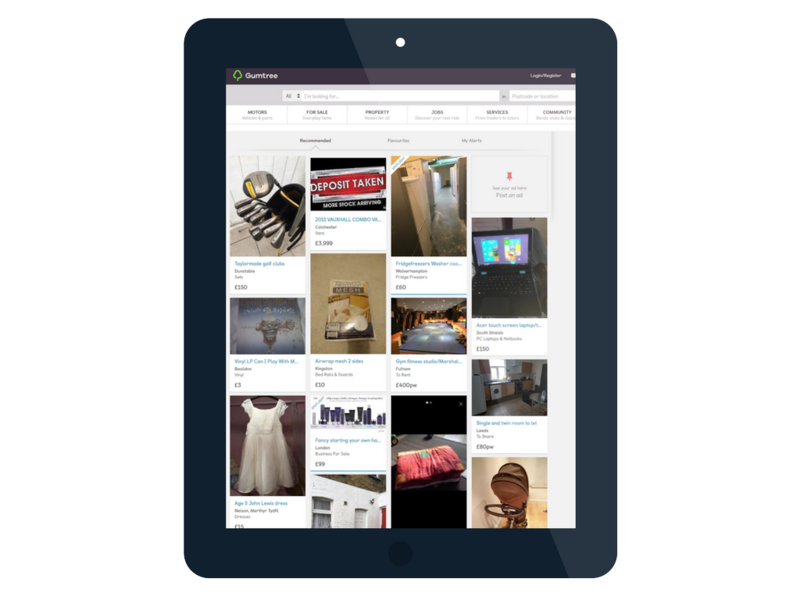 Owned by eBay since 2005, and a leading player within the eBay Classifieds Group, Gumtree reports 14 to 19 million unique visitors a month and is the ‘go-to place for everything’ from iPhones to cars, jobs to accommodation. Build knowledge and awareness of its diverse offerings: although it has a high level of brand awareness among key audiences, certain services enjoy deeper understanding over others. “Our strength is in our variety and while this is integral to the business, sometimes we’re known for just one thing to one individual when there are actually many services we can offer to them throughout their lifetime,” said Campbell. Improve proactive reputation management: working alongside its public affairs and public relations agencies, Gumtree needed a strategy for staying on top of emerging issues and ultimately create proactive PR campaigns and earned media strategies. This went hand-in-hand with improving trust, which is a clearly defined issue for Gumtree. Grow web traffic: Gumtree particularly wanted to address seasonal fluctuations in site traffic. For instance, when preparing for the holiday season, shoppers typically move away from classified websites like Gumtree to online retailer sites to buy their Christmas presents. Growing web traffic overall should ultimately even out the impact of slower periods and lead to a boost in revenue. Gumtree and its media relations, public affairs, and social agencies, partnered with Cision Insights to develop a communications measurement framework that aligned to its communications objectives. 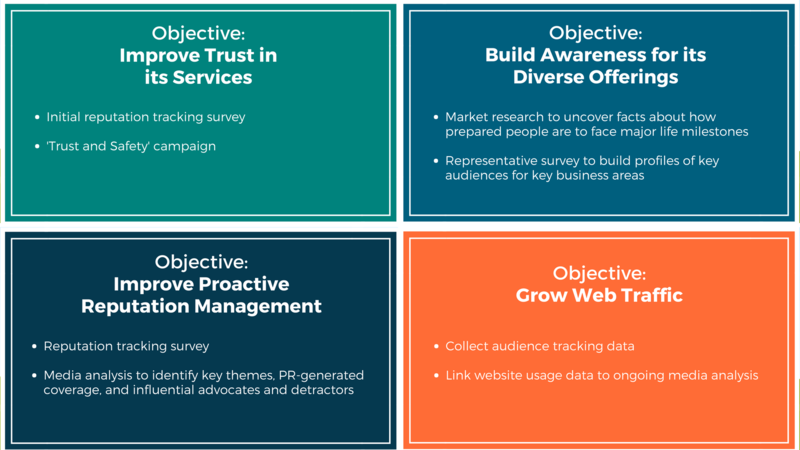 To support the framework, an integrated measurement plan was developed and implemented using multiple data sets, including: media analysis, market research, and website analytics. 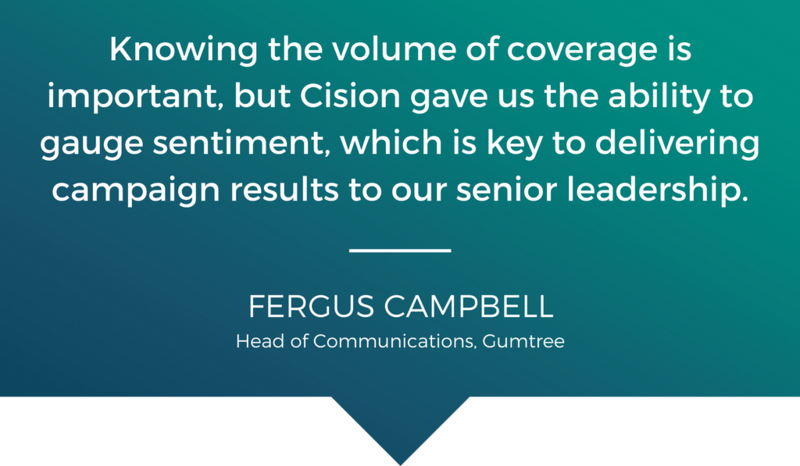 Gumtree worked with Cision to build an ongoing reputation tracking study, targeting its key consumer and business-to-business audiences. The first iteration showed that the top three qualities these audiences looked for in an online retailer were value, ease-of-use and trustworthiness. The research showed that Gumtree performed well against value and ease-of-use but performed less well on trust, confirming that this communications objective required immediate proactive communications strategies. To identify key journalists and other influencers in order to build a journalist outreach program. This helped build relationships to mitigate potentially damaging stories. To identify problem areas and to help Gumtree respond. For example, its pets’ business area had gained some negative coverage due to illegal breeders. Gumtree partnered with the RSPCA in a joint investigation which found that online listings advertising dogs and puppies for sale broadly tallied with its own puppy farming hotspots. Together, they gained coverage in high readership titles, detailing this research, while stating that they were working with the RSPCA to make sure there was an effective crackdown on illegal underground puppy trading where possible. To act as an early-warning on specific stories. For instance, when a mother was scammed on the Gumtree site when purchasing Ed Sheeran tickets, Gumtree’s safety team responded within the day, highlighted its concerns and directed people to their website to find out more information about how to protect themselves online. To develop and launch a proactive ‘Trust and Safety’ campaign to build mutually beneficial relationships with key stakeholders including cybercrime organizations and the police. The campaign helped build trust with these organizations who are now working collaboratively with Gumtree to help reduce fraud. Gumtree addressed the need to build awareness and understand with a set of PR campaigns: the Economy of Relationships, the Economy of Parenthood and the Economy of Adulthood. These linked campaigns focused on how Gumtree helps people during key life stages. Once again, Gumtree began with market research to help find meaningful story angles, and to gain deeper awareness of their brand’s impact within key audience segments. 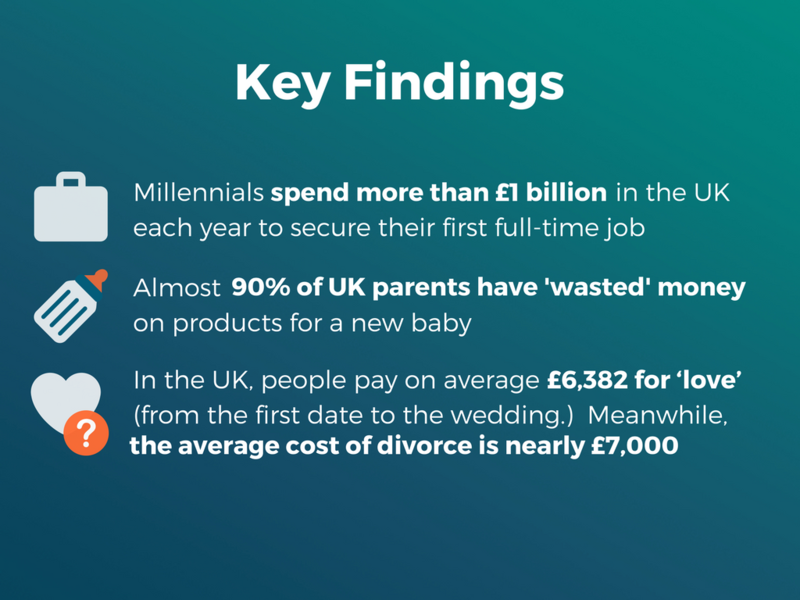 They began with a study of target audiences (such as millennials and parents) to discover what they considered to be ‘key life stages’, and how prepared they are for these events. This, combined with additional research, uncovered some interesting tidbits, including: Gumtree used this information to create content, including media pitches and press releases quoting Gumtree’s spokespeople relaying the message that their site is a great place to go at times when you need your money to stretch a little further. This effort was coupled with a deep look at the media consumption of these audiences. Cision used UKPulse, a representative survey of 10,000 UK consumers, to gather information that was used to build targeted media lists, and evaluate Gumtree’s previous success in sharing their messages through coverage from relevant media outlets. The data was also used during and after the campaigns to understand how successfully these audiences were reached. 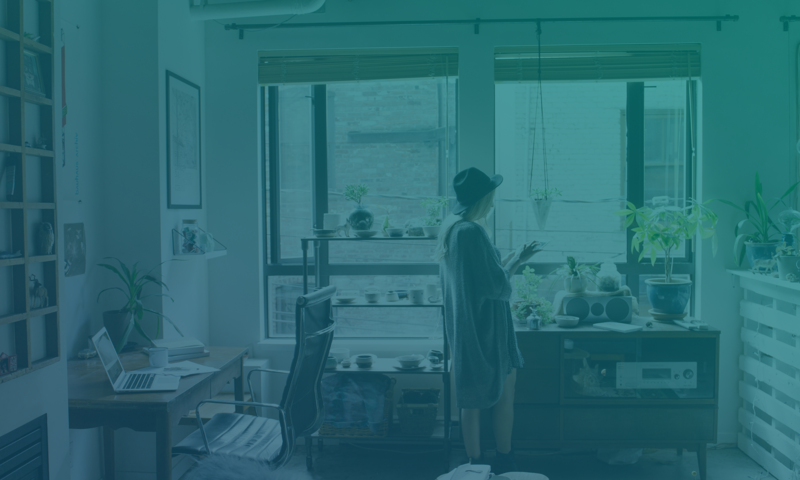 Open-ended theme tracking– Key themes could be added quickly to the analysis to help Gumtree understand emerging issues and to adjust its PR efforts accordingly. Emerging positive reputation factors included: making money and security, while negative reputation factors included: fraudulent posting, negative customer experience and stolen goods. This allowed the communications team to react quickly to new issues as they arose. PR-generated coverage– Cision worked in partnership with Gumtree’s PR agency to ensure that all proactive and reactive coverage was categorized correctly so Gumtree could get an understanding of the month-on-month changes to PR coverage and its impact on sentiment, brand messaging and reach. Influencers– Each month, analysts highlighted influential advocates and detractors. This included journalists and third party spokespeople Gumtree should be aware of when launching future PR campaigns or when responding to negative stories. For all activity, it was important to understand the ongoing impact on consumer awareness levels and how favorably or unfavorably they viewed the brand. “This really helped us see if our PR and communications messaging was resonating with our key audiences,” said Campbell. Website analytics were used to show their effect on site usage. For example, Gumtree noticed an annual ‘Christmas dip’ in traffic as people move away from classifieds sites to retail outlets to buy presents. In addition to the audience-tracking data, Gumtree was able to link their website usage data to media analysis to understand how media coverage was driving usage on the site, particularly around key points in the year. To keep all communications objectives on target, Gumtree worked with market research company Opinion Matters to develop a quarterly tracking survey based on 1,000 consumer and 500 B2B respondents for each iteration. Awareness levels –to understand who was aware of the different services offered by Gumtree, and how this was changing as PR campaigns ran. Attributes –asking consumers what attributes they associated with different business areas to see if there was a direct link. Channel – understanding exposure through different media and marketing channels, and if it was positive, negative or neutral in tone. Reputation – asking consumers to rate Gumtree as a brand by sentiment and monitor this over time. It was also important to correlate this with media sentiment. Mission Statement – consumers were asked if Gumtree is a platform which is safe to use. After 12 months with this measurement framework in place, Gumtree saw significant gains in awareness, reputation and website traffic. The reputation tracking survey highlighted that ‘trust’ and ‘safety’ were a concern while media analysis showed that negative coverage relating to fraudulent items increased in the first few months of last year. This led the team to focus on tackling the issue through its ‘Trust and Safety’ campaign. This raised awareness that Gumtree was making progress in making the site safer to use and educating users on how to protect themselves. “This research gave us confidence, as we knew the status quo of our audience and could plan communications campaigns to improve those perceptions,” said Campbell. Media analysis showed that the ‘Trust and Safety’ campaign drove coverage during the campaign period, with a peak in the ‘safe place to trade’ and ‘security’ messages, which were delivered in 19% and 37% of articles respectively. “These research methods not only help us guide our projects but also help us measure the role/impact of our third-party PR services,” said Campbell. The focus on target media meant that Gumtree was able to drive a high exposure amongst its target audiences. “In a data-driven organization like Gumtree, the use of measurement has become essential to demonstrate the effectiveness of our communications activity and how we support the business,” said Campbell. There have been significant increases in the proportion of people who think Gumtree is good value and easy to use. Gumtree saw a 10% year-on-year increase in direct visits to the ‘For Sale’ area of the site.